Not sure what to expect from a brand new Hartman Amalfi garden furniture set? Why not watch our video and find out all you need to know before buying a new set for your garden for Summer 2019! Amalfi is an exquisitely decorative cast aluminium garden furniture range from Hartman. It features elegant floral designs and comes with Weatherready cushions as standard. The range is available in two all-new colourways on Garden4Less this year. Explore this stunning range below. 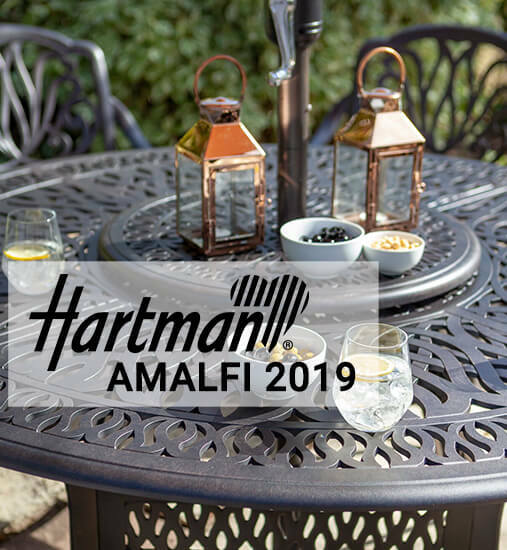 If you're looking for luxury cast aluminium garden furniture, look no further than the Hartman Amalfi range. Suitable for modern and traditional outdoor spaces, Amalfi features stunning, floral designs on its chairs and intricate detailing on its tabletops. Its substantial cast aluminium construction and elegant, decorative design make Amalfi a range that will look fantastic for many years to come. It's low maintenance, won't rust and can be left outside in all weathers. The cushions that come on Amalfi 2019 garden furniture are Weatherready and make use of a clever design which allows water to pass through during heavy downpours. As well as this, they have an outer coating which means that water beads up and rolls off in lighter showers. 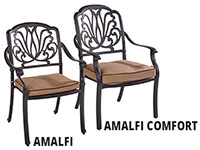 As well as the regular Amalfi range, we also stock Amalfi Comfort. This range uses the exact same design as its counterpart but is larger and chunkier. As a result, this furniture is somewhat heavier so this may be something to bear in mind when considering which furniture range is right for you. In addition to its larger body, the Amalfi Comfort range also comes with thicker cushions that provide sink-in-your-seat comfort.